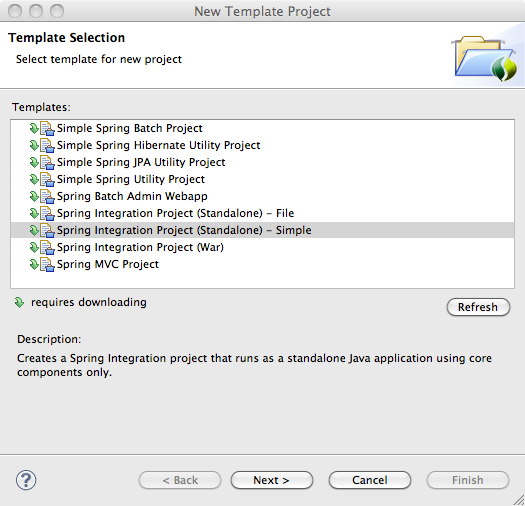 The Simple template creates a basic Spring Integration project, which runs as a standalone Java application, using only core Spring Integration components. In order to illustrate File polling capabilities, the File template uses additional components to poll file directories as well as to route those files. Lastly, the War template allows users to easily create basic Spring Integration projects that are targeted to run within servlet containers (e.g. Tomcat) as part of a WAR deployment. For illustration purposes the War template uses the Spring Integration Twitter adapter. In order to start a new project using STS Spring Templates, go in the main menu to File, then NEW and then Spring Template Project. The Template Selection Screen will show up next. This screen provides a list of all available Spring Templates, including the 3 previously mentioned new templates for Spring Integration. If you see that little arrow in front of the template name - that means that the actual template has not been downloaded, yet. Once downloaded, the Templates will be cached on your machine and you won’t need to download the template files again, unless you press the Refresh button and a new version of the template is available remotely. Once you proceed and the template has been downloaded, you will be presented with the Project Settings Screen. There you have to provide the project name and certain properties that make it easy to deploy your newly created project to a Maven repository. In fact, besides creating the Eclipse-specific project files, this Template wizard will also generate a project pom.xml file, which will make this project easily usable outside of STS as well (E.g. for building this project as part of your Continuous Integration process with tools such as Jenkins). Thus, besides the project name, you have to provide a groupId, an artifactId, and a version property. Lastly, you also need to define a top-level (base) package under which your relevant source files will be located. Once you press “Finish”, the project will be created and it should be listed to your left in the STS Package Explorer window. At this point you now have a fully functional Spring Integration project. This command will clear the target build directory, compile and package the application and execute the application using the Exec Maven Plugin. The application will start up just as it did in STS. Pressing “q” will quit the application. What this application does, is that it allows your to enter some free form text via the command line, which is then converted to an upper-case representation and printed to the console. In order to make this happen, Spring Integration is being used. However, if you look at the details of the Main class that bootstraps the Spring application context, you will notice that it has no references to Spring Integration itself. All the main class basically does is to retrieve an instance of the “StringConversionService” interface from the Spring Application Context. This interface, though, is used by a Spring Integration Gateway to capture the entered String and forward it to the request channel. The project’s application Context XML file is located under META-INF/spring/integration. 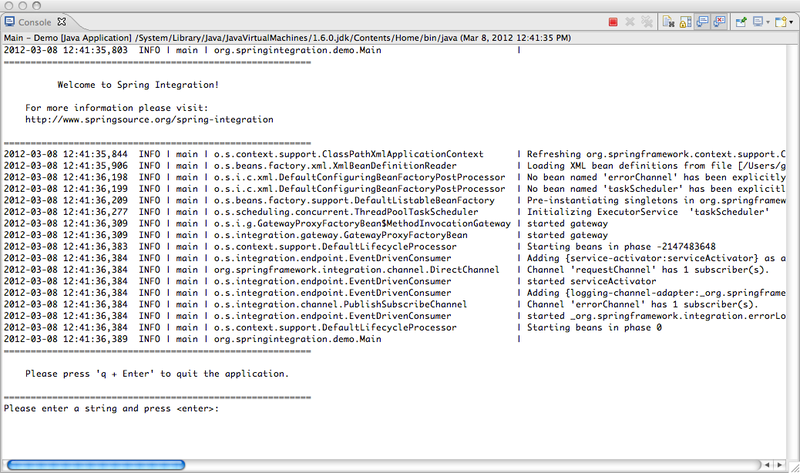 As you can see, the application consists of a very basic Spring Integration flow. We start with a simple Gateway that uses the previously mentioned StringConversionService interface. There are 2 defined message channels. The first channel will route the Message containing the input string to the service-activator. The service activator itself will use Spring Expression Language (SpEL) to convert the input Message’s payload to uppercase. And via the reply channel the upper-case String is returned to the caller and printed to the command line. Furthermore, please be aware that we are using the Service Activator in this template in order to illustrate the execution of other Java-based business services. If your goal is to purely transform Spring Integration Message Payloads, please also consider using a Transformer, which may be a better fit semantically. This is a very simple use-case but it provides you with a nice starting point to implement your own Spring Integration components. 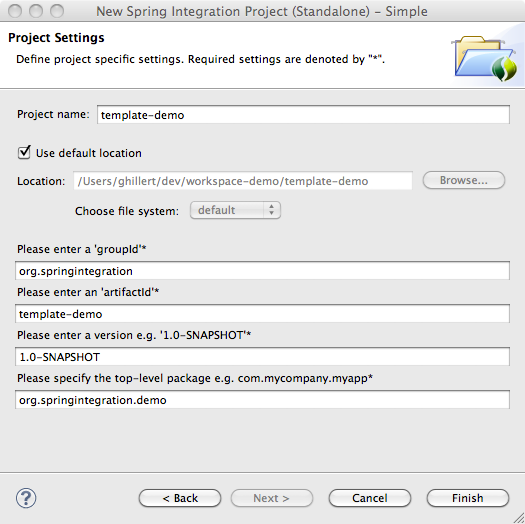 We expect that these templates will substantially lower the barrier of entry to learn and experience the benefits of using Spring Integration in your own projects. If you have any questions, we would like to hear from you. Please visit the Spring Integration forum at forum.springsource.org for any questions you may have. For more information on Spring Integration in general, please also visit our project website at: http://www.springintegration.org/.